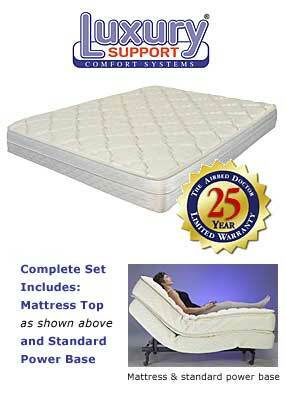 Plush Top Design, Plush Top Comfort! 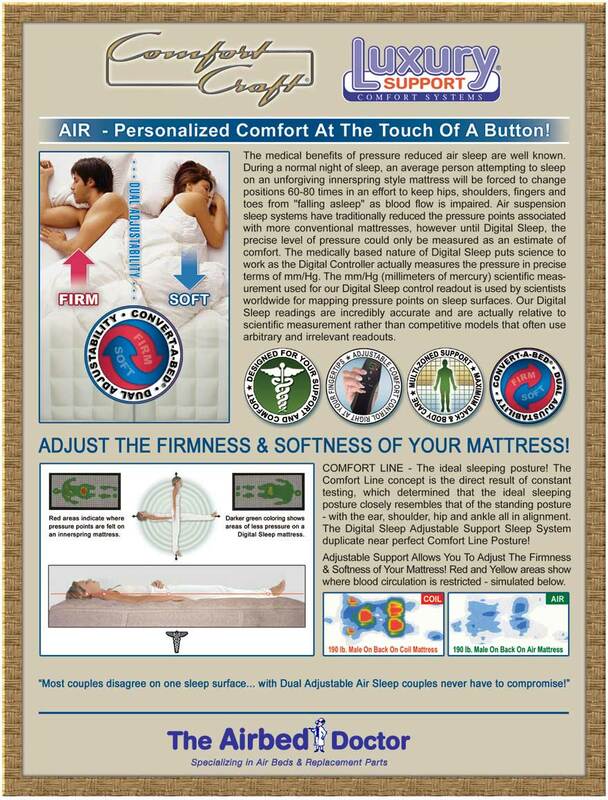 The Evolutions Air Bed is a handsome Plush Top Mattress designed with extra thick 20 ounce Holofill Polyester with a durable Belgium Damask fabric cover featuring the Breathe-Easy, Hypoallergenic Ultra Fresh treatment to increase Comfort, Fabric Freshness, Hygiene, and Mattress Life. Includes:Vulcanized Chamber, Vulcanized Foam Comfort Topper. Premium Performance and Ultimate Sleeping Comfort Featuring Discover the convenience and features of premier craftsmanship and design associated with only high-end beds in this value priced mattress. A closer look, both inside and out, reveals an impressive list of features including European tailoring, fully upholstered internal bolsters and quilted in-cover backing. Three preset and one programmable position. Ergonomically designed wireless hand wand. Raised rubber buttons, back lit key pad and LED signal. Universal headboard bracket and four twin wheel locking casters. UL and CSA listed. 60-degree pitch and RF and IR available. Chrome mattress retainer and lightweight powder coated frame. Two variable speed recessed D.C. massage motors with 30 minute auto off timers. Fits within most headboard/footboards and bedframes. Solid state wireless remote with wave motion and bed flat features. 24 volt D.C. Massage Motors, variable speed and recessed into fiber base.